It was far closer than The Red Ant predicted, but the Lift One Corridor measure passed at the polls on March 5, 1562-1536. The narrow 26-vote victory means that the historic western portal to Ajax will soon see a long-needed shot in the arm and resurrection from its blighted third-world appearance, with the addition of Lift One Lodge (34 fractional units and 6 condos), Gorsuch Haus (81 rooms), plus bars, restaurants, skier services, an underground parking garage, ski museum ... and the piece de la resistance, a replacement for Lift 1A located 500 feet closer to town at Dean Street. 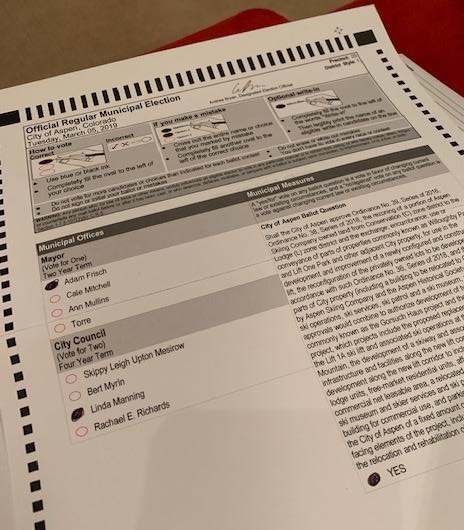 Notably, the city clerk's office reported that many voters had contacted the office to inquire about the location of this single ballot question on their mail ballot. In the end, 135 ballots did not have a vote for or against the Lift One Corridor question. What on earth is up with that?? Here is a photo of my ballot before I mailed it in. Hello?? I have looked at this from every angle and cannot for the life of me figure out how voters couldn't see the single ballot question right there. But The Red Ant doesn't think it was because of the date change to early March. (Recall that in November 2018, 62% of Aspen voters elected to change the municipal election date to March from May in an attempt to improve voter participation, never mind the elections are by mail ballot and the city clerk will mail your ballot anywhere so that you can vote.) In last week's election, nearly 60% of registered voters (3220 of 5398) cast ballots. The previous record for voter turnout was 2544 voters in 2009 (the Marilyn v Mick mayoral contest). It is my firm belief that the Lift One Corridor ballot question drove voters to the polls. In fact, the earlier election date made it far more difficult for candidates and issue committees to reach and inform voters amid the chaos of high season and the clutter of everyday relevant news and happenings in wintertime Aspen. Notably, there were 993 "undervotes," illustrating that 993 voters either "bullet voted" for one candidate or abstained from voting in this race. These are strong personalities. Rachel, Aspen's godmother of subsidized housing and ever the career politician, couldn't even get out of her first post-election interview without lamenting that she won't be on the payroll until June. Skippy will quickly learn that governing is quite different from self-promoting. How he adapts will determine his effectiveness. Right now, he's a lot of drama. Can he check his ego at the door and transition into substance? It was clearly not The Red Ant's night when it came to endorsed candidates. No candidate received the 50%+1 votes needed to be elected mayor on the first ballot, so Ann Mullins will square off against Torre in a run-off on April 2. Look for your mail ballot TODAY. (Any questions, contact the city clerk 970-920-5060.) In-person voting begins at city hall today as well. There were 77 undervotes in this contest. The Red Ant is particularly sorry to see Adam Frisch leave the council table. He always made himself accessible to discuss the issues, even when we didn't agree. Please take a moment to read his magnanimous thank you letter HERE. Since you asked, The Red Ant is not endorsing either candidate for mayor. In what has shaped up to be the absolute worst choices for a very important role in Aspen politics, I simply cannot get behind either one of them. For a short while, I saw Ann as the least worst. This, despite the fact she has never so much as acknowledged or returned an email aside from my candidate questionnaire. She supported the Lift One Corridor and I thought this ought to be rewarded. But after receiving answers to a few very pointed, very pertinent and very direct questions, I realize that she is just another politician - afraid to take a strong stand and articulate it. Hardly mayoral. This should have been a lay-up. HERE are her answers to questions about the future of the Old Power House, the formation of a citizens financial peer-review committee to assist council with financial analysis, a new and improved design for city hall now that Barwick is gone and we can change the outdated blueprint that he worked tirelessly to railroad into being with no public design process, the pros and cons of developing the BMC lumberyard into subsidized housing, actionable ideas to actually intercept cars at the Intercept Lot, and her opinion on the city's plans to add 11 employees at a cost of $1 million to the city payroll. Complicating the issue, should Ann be elected, the new council (Ward Hauenstein, Ann, Skippy and Rachel) will be charged with selecting a replacement to fill the remaining two years of Ann's council term. There will be an application process, but it's jokers wild as to how THAT will go. And it could very well go sideways (think of the nincompoops who might apply and be selected). And if the Big 4 at the table cannot reach a consensus, the issue will get kicked back to the voters for yet another election. As if we need that. But that would mean that somehow it's better if Torre is elected. Ugh. The prisoner's dilemma. The good news? This incoming council will only be seated for 21 months, not 24. This is a result of the 2019 election being moved from May to March. The current (outgoing) council was sworn in to their terms which end in June 2019 so that's when the new cabal will be seated. Me? I plan to save my stamps and sit this ballot out. The choices are THAT bad.